Have you ever been entrusted with an important message to deliver to someone? If so, you prob­ably worked hard to make sure it was delivered properly. That’s how Paul must have felt about the gos­pel he preached. It was a universal, revolutionary message: Salvation is available to Gentiles and Jews alike! No one is outside of God’s power to save, heal, and transform! Two thousand years later, God is still looking for people willing to become stewards of his grace. He is calling you to proclaim the surpris­ing news of salvation. 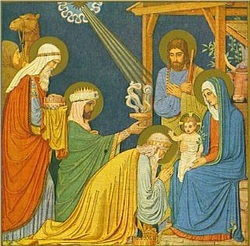 Why talk about our call to evan­gelize on the Feast of the Epiphany? Because today we celebrate the way Jesus’ glory was revealed to the Magi. Today we celebrate the way the Magi saw something special in this boy from Nazareth—something special enough to make them want to offer him valuable gifts. In a similar way, when we share with people the message of Jesus— the universal, revolutionary mes­sage of salvation—we are showing them something glorious. We are proclaiming the greatest, most awe-inspiring news in history: Heaven is open! Salvation has come! This is a high calling indeed! Every time we share the message of God’s grace, we offer people a chance to have their own epiphany. We can go so far as to say that just by living out the gospel, our lives can become an epiphany—a glori­ous manifestation of the power of God to transform human hearts! So as it turns out, St. Paul is not the only one privileged to be called a steward of God’s grace. That title belongs to each of us. So let’s treas­ure our role in God’s plan—and, above all else, let’s treasure the sal­vation that we have received! The first reading speaks of both darkness and light. In what ways do you see a battle waging in your heart and mind between the desires of the flesh (carnal desires) and the desires of the spirit (Godly desires)? What are some steps you can take to “win” this battle? Jesus said that he is the light of the world. In what way is Jesus the light of your life? For example, do you speak with him daily in prayer? Is he the light that guides your daily decisions? In the responsorial psalm, the psalmist asks for “justice” and “right judgment.” How important are these attributes to you in your family life and your business life? What steps can you take to allow them to have an even greater importance? St. Paul tells us that “the Gentiles are coheirs, members of the same body, and copartners in the promise in Christ Jesus through the Gospel.” What does this mean to you? What are some of the promises that you are a coheir of and copartner in? In the Gospel, we again see the humility of God – he chose insignificant Bethlehem for the birth of Jesus instead of Jerusalem the capital city and home of the great temple. How important is humility to you as a virtue? Would your relationships with others, or your dealing with your family, be described as humble? Why or why not? Herod had told the Magi to “go and search diligently” for Christ. As we start the New Year, what steps can you take to seek the Lord more each day and allow him to occupy a greater part in your life? In the meditation we hear these words: “Every time we share the message of God’s grace, we offer people a chance to have their own epiphany. We can go so far as to say that just by living out the gospel, our lives can become an epiphany—a glori­ous manifestation of the power of God to transform human hearts!” How would you describe any “epiphanies” in your life, when God touched you in a special way? Have you ever shared these epiphanies with other people? What was the result? Take some time now to pray that in 2012 you would be faithful stewards of God’s grace, including sharing the good news of salvation with others. Use the prayer at the end of the meditation as the starting point.